April 30, 2019 is a new placeholder publication date for The Mueller Report. 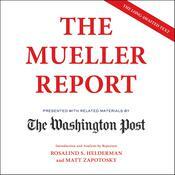 The actual publication date for the ebook, audio, and paperback editions of The Mueller Report will be determined when and if the Special Counsel’s findings are made public. .Read the findings of the Special Counsel’s investigation into Russian interference in the 2016 election, complete with accompanying analysis by the Post reporters who’ve covered the story from the beginning.